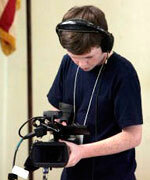 Brian Niles was born in Pasadena and attends PUSD’s Marshall Fundamental School, where he is in sixth grade. Mainly teaching himself through making shorts, Brian learned videography techniques and editing tools before attending the Digital Media Academy at UCLA in summer 2011. He’s looking forward to learning more through the Go Public project about what happens throughout the school district where’s he grown up, while also getting professional-quality experience for his future filmmaking career.